Okay, let’s speculate that you’ve read Part 1 of this series about WHY you should make a video, and you’ve decided to be super proactive and take the plunge. A wise decision, maestro. Video is an incredibly persuasive and sticky way to convey a message. When you put something out there, you are showing the world what you’re all about. So, what do you want them to see? You may be creating some supporting material for your marketing plan, or introducing a new product or service. But even when you have an idea of what you want to produce, there’s still a lot to consider. Is it relevant to your overall strategy? Does it focus on your strengths? Does it convey a clear message? Can it be branded? Do you have the budget to do it right? Do you have a plan to promote it once it’s ready? A good quality video involves a good deal of planning. We’ll touch a bit more on that when we get to the HOW part of the series. But suffice to say, you’ve got a lot to think about right now. First up – subject matter. This is the foundation for everything that comes after. All of your concepts, messaging, scripting, storyboarding and production planning, up through the actual shoot and edit, use the WHAT as a basis for decision making. Getting this locked down correctly at the beginning is a no-brainer. Who better to talk about your company than one of the folks at the top? Your executives can convey the company message or mission with strength and credibility. Seeing execs speak on behalf of your business gives you a chance to show the “human” side of what you do. Or, you could interview a credible expert in your field, such as a leading engineer. This can add a good deal of strength and authority to your brand, while attracting audiences of a similar caliber. Asking a customer to speak on your behalf can be very powerful. The goal is to show a prospective client that someone like them has used your product or service and they want to help spread the word. It’s classic marketing – the “all your friends are doing it” approach. But there is one important caveat – the testimonial must be genuine. You don’t want this to seem faked. Could you hire an actor? Sure. But, most people will see right through it. And not only will that turn them off to the pitch, but also to you as a trustworthy resource. While it’s more of an inward-facing resource, it may make sense to compile company training videos. These can cover anything from new product training to internal procedures, policy changes, legal processes and more. It’s a great way, especially in larger companies, to ensure that there is a high degree of standardization and consistent messaging in the training process, and leaves little to chance. A great way to connect with your shareholders or customers, corporate meetings or conference videos provide more of a behind-the-scenes look at your company. 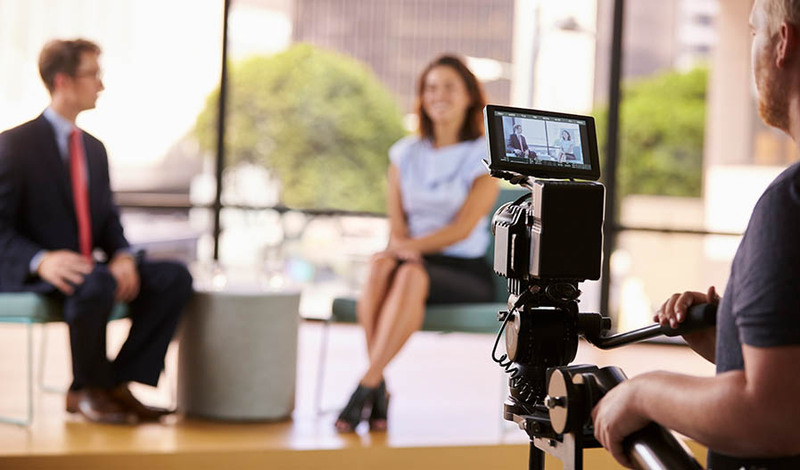 While it’s rather unlikely that your seminar video will go viral, this type of video provides a real, down-to-earth kind of connection with some of your most loyal brand advocates. Another advantage is that the logistics have mostly been worked out already. You generally don’t book a seminar just to film it – you’re simply adding the filming aspect to a conference or meeting that is already scheduled. This also cuts costs by removing the scripting and storyboarding, and simplifying the task of editing. There is no better way to tell a potential customer all about you than with a video that is, well, all about you. This approach leaves very little to chance when it comes to showing the world who you are. You can carefully craft the message and optics, share your vision, and really put your best foot forward. An “About Us” video allows you to present what and who you are, what you stand for, and where you are going. But just like Client Testimonials, you want this to be a genuine representation, not just a bunch of make-believe fluff that doesn’t accurately portray your company. Highlight your strengths, feature your people, and try to capture the character of your company. It can be technical, humorous, serious – just be sure it’s designed to speak to your customer. If you’ve developed a new product, video is a very strong tool in your marketing strategy to help roll it out. It gives you the opportunity to actually show the product in detail, highlighting the features and benefits in a way that is more easily understood and absorbed. And there’s nothing better than actually watching a product in action. A demo video can show your prospective buyer exactly what the product does, how it does it and, most importantly, how it will do it for them. While this isn’t one of the most common corporate video styles, it has gained popularity in recent years as a hybrid of an “About Us” and a more Feature Film-esque kind of production. Documentaries can take the viewer out of the first-person into more of a third-person mindset, which is a more disarming and absorptive format. Also, the docu-style video tends to be longer, allowing for a more detailed or in-depth presentation. In other formats, it may be better to keep your videos shorter to hold the viewers’ attention, but this format draws a viewer in and naturally hooks them for an extended time. Most people won’t think of this option and I hope you’ll never need to do it, but we all make mistakes. And sometimes big companies make BIG mistakes. Morally, ethically and financially, it’s always a better business decision to step up and be accountable. Most people will forgive if you own it, but no one forgets if you don’t. Again, video is persuasive and sticky, which makes it a great option if you’re trying to right a wrong. Remember (and by now this should go without saying), be genuine, be humble, make amends, be forthright, and be responsible. You’ll likely find that your customers will stick with you, and perhaps have a greater respect for you. No matter what kind of video you decide to shoot, do your best to engage your audience. Make it interesting and make sure it’s branded. Go the extra mile to ensure that it’s a quality representation of your company. And don’t forget, there is another great benefit to this process. Your video can easily feed your other marketing channels. For example, you can take smaller chunks of the main video (or even stuff that got cut from the final edit) and use it on your social media, or use a transcript to create blog posts. Get creative and utilize the content in any number of ways to help spread your message. For a guide on how to choose the right video agency for your next project, click here!